Plasma Ruggedized Solutions tests both finished products and their component materials for superior quality and functionality. We offer laboratory analyses for in-process products, failures and field returns. The wide variety of testing, screening, and laboratory services we offer ensures that our customers receive the highest quality finished products, and helps us make continual improvements to our conformal coating, potting/encapsulation services. Environmental Stress Screening: Environmental stress screenings simulate the environmental conditions that our customers’ products will encounter throughout their working lives. We use a special in-house, climate-controlled chamber to test the effectiveness of the coatings we’ve applied against extreme temperature and humidity. Click here to learn more. Ionic Testing: Plasma Ruggedized Solutions’ ionic testing services validate components for a wide variety of conductive contaminants prior to the application of our conformal coatings. Ionic testing helps determine an assembly’s potential for electrical or physical failure, as well as the potential for loss of coating adhesion. Click here to learn more. Hi-Pot/Continuity Testing: These two processes check the quality of the electrical circuitry in a component. Through hi-pot testing, we determine the highest safe level of electrical current that can be applied before the circuits will break down. Continuity testing ensures that all circuit paths in your assemblies perform as they should. Click here to learn more. 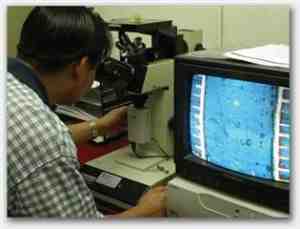 Cross Sections: Also called microsection analysis. Plasma Ruggedized Solutions can perform cross section tests during and after our customers’ assemblies’ production processes, to ensure proper construction techniques, correct material properties, etc. We also perform these tests after product failure, to determine what went wrong with the product and why. Click here to learn more. Two-Dimensional X-Ray Diffraction: This testing method is used to inspect visually inaccessible sections of circuit boards and circuit assemblies. It checks for open and short circuits in your products, and can be used to inspect the construction quality of the inner layers of our customers’ products. Click here to learn more. Plasma Ruggedized Solutions also offers a variety of electrical testing and software testing services, using customer-provided testing equipment. We encourage our customers to send their testing equipment and product requirements with their products, and we will gladly test them ourselves, in-house, to guarantee that the products function as expected. We also test customer products that arrive at our facility directly from a third party (i.e. straight from the manufacturing plant, without having been inspected by our customers first) to ensure the quality of the product before we proceed with our coating services. Contact Plasma Ruggedized Solutions today for further information about our testing, screening, and laboratory services.